When you flex your bicep, your muscle sends information to your brain, allowing you to feel your muscle contract without even having to glance at it. But if you have a bionic limb, you don’t get that same sensory feedback. “When I move my bionic ankles, I don’t feel the movement of the ankles, and when the torque increases on my bionic ankle joints, I don’t feel that torque,” says Hugh Herr, who co-directs the Center for Extreme Bionics at MIT, and whose legs are amputated below the knee.Herr and his team are trying to change that for amputees, using muscle grafts and existing nerves at the amputation site. They described the new technique in a study recently published in “Science Robotics.” According to Shriya Srinivasan, a PhD candidate at MIT and Harvard and lead author on the research, it’s based on “the fundamental motor unit of the human body,” the agonist and antagonist muscle pair. According to Srinivasan, the kind of sensory feedback provided by agonist-antagonist muscle pairs is key for fine motor control. But in a typical amputation procedure — which she says hasn’t changed much since the Civil War — that feedback pathway is damaged. “It essentially involves cutting through the skin and the muscle and then finally the bone at the site of amputation, and wrapping the muscles around that area and closing the skin around it,” she says. “And what’s severed [are] all the nerves that are controlling your muscles, and this fundamental agonist-antagonist muscle relationship.” As a result, she says, current users of prosthetics have to visually follow their limbs to know what they’re doing. “And because we’ll have muscle pairs, we can also take these signals out and have finer prosthetic control — and be able to modulate position, velocity, and stiffness of prosthetic devices, which is a significant improvement to the clinical standard,” she says. With each muscle pair, she explains, researchers can also implant a set of sensors telling the bionic limb how to move. In the study, researchers tested the technique in rats, using grafted muscle pairs to send sensory information back to the brain. Now, according to MIT’s press release, they plan to begin applying it to humans, using muscle grafts of about 4 centimeters by 1.5 centimeters. Srinivasan says the technique won’t just be limited to recent amputees — it could also be used as a “revision procedure” for people like Herr, who had limbs amputated long ago. Shriya Srinivasan is a PhD candidate in the Health Sciences and Technology Program at MIT and Harvard in Cambridge, Massachusetts. IRA FLATOW: This is Science Friday, I’m Ira Flatow. If you’re not driving right now, I mean not driving, I’d like you to do a little experiment with me. Ready? Close your eyes, hold your arm out straight in front of you, and then slowly bend your arm up to say, let’s about 45 degrees. OK. You can open your eyes and check. How close did you get to that 45? Pretty close? But you have ever thought about the reason? The reason you can do that? How you know where your body is in space at any moment in time? It’s because your muscle sends a lot of information back to your spinal cord. Information on its length, the speed of its contraction, the force it’s up against. And all that sense information gives your brain a perfect picture of what’s going on with your arm. You get that hand-eye coordination. But you don’t even need to have your eye on it, eyes open to do that. But people with bionic arms and legs and ankles and feet, they don’t get all that sensory feedback on the movement and torque of their limbs. But my next guest is working on a technique that may bring some of that feeling back. Shriya Srinivasan is a PhD candidate in the health sciences and technology program at MIT, and at Harvard the same time. And one of the authors of a new study on amputations and bionic limbs in the journal Science Robotics . Welcome to Science Friday Shriya. SHRIYA SRINIVASAN: Thanks for having me, Ira. IRA FLATOW: Let’s talk about that example I talked about in the intro to this segment, moving your arm, your eyes closed, and still knowing where your arm is. Walk us through what’s happening there with all the nerves and the muscles. SHRIYA SRINIVASAN: Absolutely. This is based on the fundamental motor unit of the human body, which is the agonist and antagonist muscle pair. And you have one of these muscle pairs for each joint. So take for example, the biceps and triceps, they form an agonist, antagonist pair. And when you contract your biceps, like you had mentioned, your elbow flexes, and your triceps undergo a stretch. And this stretch signal is sent to your brain to let you know where your arm is in space, how fast it’s moving, and the kind of weight or load that it might be up against. The bicep, tricep pairing also allows you to be able to control how stiff your arm is when you move it. And this sensory feedback information really allows people to have fine motor control. It allows you to plan your trajectory without having to think about it or visually track your limbs. And it’s really important for having smooth and continuous movement. IRA FLATOW: We talked with your colleague, Hugh Herr, who’s also working on this project, who lost his lower legs in an ice climbing accident. So he has personal experience with the current limitations of bionics. He couldn’t join us today, but here’s a clip from that conversation. HUGH HERR: When I move my bionic ankles, I don’t feel the movement of the ankles. And when the torque increases on my bionic ankle joints, I don’t feel that torque. So we’re aiming to give those sensations back to the bionic limb user. IRA FLATOW: And to do that, you have to get away from the technique as I say that’s what, 100, 200, 300 years old of just hacking off a limb and let it dangle there. SHRIYA SRINIVASAN: Yeah. So the standard amputation paradigm hasn’t changed in about 200 years. We look at Civil War textbooks and we see the same sort of procedures and protocols that we use today in the clinic. And it essentially involves cutting through the skin and the muscle and then finally the bone at the site of amputation, and wrapping the muscles around that area and closing the skin around it. And what’s severed is all the nerves that are controlling your muscles, and this fundamental agonist antagonist muscle relationship. And so, the prostetic user today now has to follow around their limbs visually in order to know what’s going on, and has very little sensory feedback information. In our new amputation paradigm, we’re surgically and mechanically linking regenerative pieces of muscle to each of our nerves, and having these linked so that when one contracts, the other one automatically stretches and sends that feedback signal to the brain. And because we’ll have muscle pairs, we can also take these signals out, and have finer prosthetic control. And be able to modulate position, velocity, and stiffness of prosthetic devices, which is a significant improvement to the clinical standard. IRA FLATOW: So what kind of attachment and contact do you have to make at the site where the muscles are that you’ve cut into? IRA FLATOW: Yeah, the sensors that you’re putting in. SHRIYA SRINIVASAN: Yeah, absolutely. So there are things like implantable myoelectric sensors, which record muscle signals. There’s also a standard muscle electrodes that we can interface with these muscle grafts, and these will be wirelessly communicating with prosthetic devices, to which we can send muscle signals. IRA FLATOW: So you sort of build a sort of little Band-Aid made out of muscle that you would apply to an amputated limb? SHRIYA SRINIVASAN: Yeah. Essentially, yeah. We have these muscle pairs that are created, one for each degree of freedom, and these will all fit within the residuum. And for each of these pairs, we’ll have a set of sensors which will tell the prosthetic device how to move those joints. IRA FLATOW: Do surgeons who are doing amputations, are they in on this now? Are they thinking ahead before they do the surgery on the limb and do the amputation? SHRIYA SRINIVASAN: I think as this research gets out there, the hope is that they will continue and start to realize the potential that this will offer. And that this will hopefully become the standard for people maybe a decade from now. But I think we’re also in a continual process of developing the robotic technology in making those advanced prosthetic devices that can leverage these dynamic muscle constructs commercially available. So the goal is in a decade, that this will become the standard. IRA FLATOW: How long have people been thinking about doing this? This new technique? SHRIYA SRINIVASAN: You know, it’s surprising to us that something like this hasn’t been created before. But I think it’s only relatively within the last couple– the last decade actually, that people have thought about re-engineering the amputation paradigm, in order to increase the functionality of devices that are interfaced with it. IRA FLATOW: I know that this study was just done in rats, right? Have you tried it in human subjects yet or is that coming soon? SHRIYA SRINIVASAN: We’re actually rapidly transitioning to humans and starting to put these surgeries into them. So we’ll see how that goes. IRA FLATOW: And would this only work for new amputees? SHRIYA SRINIVASAN: No. 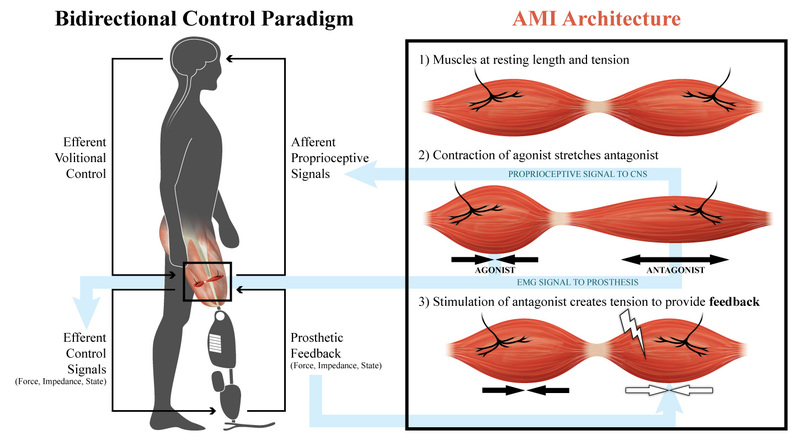 So actually, the benefit of this amputation paradigm is that we’d be able to use residual musculature or grafts from other part of the body, and do this as a revision procedure to people that have already had amputations. So Hugh for example, we could take some muscles from other parts of his body and put those into grafted locations within his residual limb. So this amputation is actually applicable to a broad range of amputees. Both prophylactically and revision surgeries. IRA FLATOW: Is Hugh going to be the first person to have this done? SHRIYA SRINIVASAN: I’m not sure, but he is definitely interested in having this done. IRA FLATOW: I’ve got to ask you before we go, why one university is not good enough. You have to do MIT and Harvard at the same time. SHRIYA SRINIVASAN: You know, it’s been a great journey and I think the interdisciplinary kind of exposure and approach that we’ve taken is a result of this collaboration between the universities, bringing in the mechatronics, the mechanics, the biomechanics, the robotics, and the neuroscience and surgery. So all these aspects we’re able to join as we increased the expertise. IRA FLATOW: So one side wants to study it forever, and the other side said let’s just do it and learn it as we go on. All right. I’m sorry, go ahead. SHRIYA SRINIVASAN: No, no, I was just going to say– yeah. So I mean we have people from both the clinical world and the engineering world coming together, and that really helped us come up with this method. IRA FLATOW: That sounds great. Well check back with us, OK? As you make progress on this. SHRIYA SRINIVASAN: Sounds good. Thank you so much. IRA FLATOW: You’re welcome Shriya Srinivasan is a PhD candidate in the health sciences and technology programs, both at MIT and in Harvard. Thanks for joining us.